I watched my daughter write a Christmas list that looked nearly identical to last year’s list and I realized that we have a problem in our house: My daughter didn’t seem to remember what she received for Christmas last year. She wanted MORE of the same things this year without realizing that she already had them. At the end of her list? a set of clothes with matching doll clothes. She had everything on her list in her closet because she got it last year. But, those last lines “I love my family. I love Christmas!” really struck me. 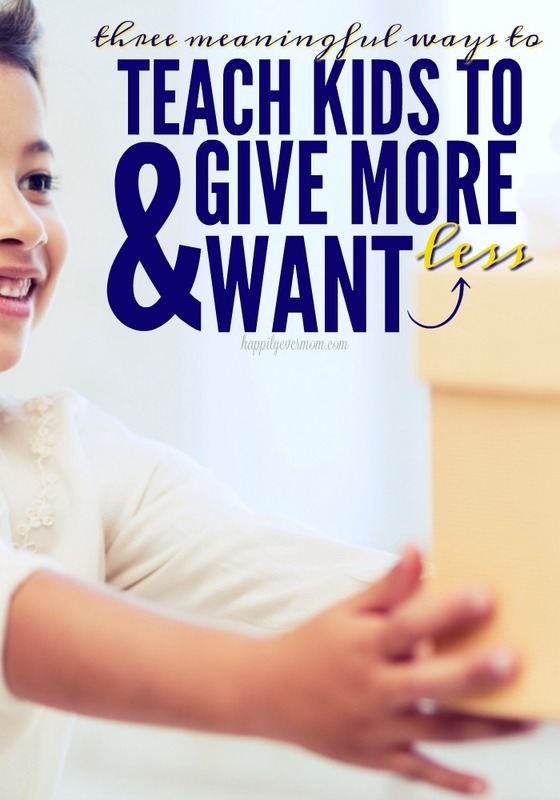 Am I teaching my kids that they can ask for more than just “things” this Christmas? A few weeks before my daughter wrote her Christmas list, we were standing in the checkout line at our local grocery store. My daughter pointed to some paper hanging alongside the checkout line (there were five pieces of paper in all). I told her that the pieces of paper recognized people who donated money to help others get food during the holidays. I think a whopping $8 had been donated in all. I paused for a minute as I really thought about what that meant. There are families in our community that need help so that they can have meals this Christmas. With my swollen, pregnant belly and my six-year-old’s hand in mine, I wondered what that would feel like. When I plan my holiday meals, my time with family, my family traditions, I don’t have to worry if they will happen or not. I know that we’ll have food on the table for Christmas this year. I know that we’ll have family with us to celebrate. 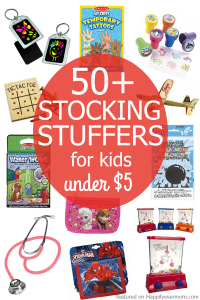 I know that I can buy gifts for my kids. And, I know that I’ll recieve gifts in return. I know, beyond a shadow of a doubt, that we will have all of those things. As I stood in that checkout line, I remembered that not everyone has that same confidence during the holidays. She was referring to donating. And, I didn’t have a good answer. The reality is that I had “extras” in our cart that day like peppermint bark, marshmallows for hot cocoa, and your everyday pregnancy cravings like pickles and ice cream. I kept putting MORE in the cart (again, blaming pregnancy). I could have put one back. Heck, I could have easily donated $1 and it wouldn’t effect our monthly budget at all. Why on Earth don’t I donate MORE? There was that word again. MORE. Do we want our children growing up wanting more or giving more? After that morning in the grocery store, I wonder if it’s just easier to say no to donating. I wonder if I’m getting hard in my old-ish age and I “distrust” campaigns like that – I think, “where is this money REALLY going? ?” more often than I’d like to admit. Then, I wondered if it doesn’t effect me enough. When I want something, I have the luxury of getting it. We’re not rich, but if we see something that we’d like to buy, we can purchase it. And, my kids can too. She wants the same things as last year. In an effort to teach her that she can ask for more than just “things,” I interviewed her. I asked her what she loved doing together as a family this year. Her response? Camping. And, it was a light bulb moment. If we need MORE of something in our life, it’s experiences together as a family. If camping is what she loved most, then let’s focus on asking for gifts that allow us to go camping MORE. I told my husband about that idea and he loved it too. 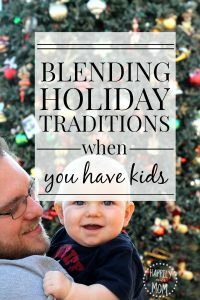 This time of year is not just about teaching my kids to want less and to give more, but to teach them that gifts are not just about things that go blinky blinky, things that you forget about after you play with them once or twice, or coming up with “something” because people want to get you a gift. Instead, think of what you want to experience MORE of next year. Why not ask for a baking kit or movie tickets or a new tent? While I love the little traditions that my family has developed over the years, the best gift that my husband and I can give to them is that desire to give more to others. To be content with what they have. And, to think beyond themselves. 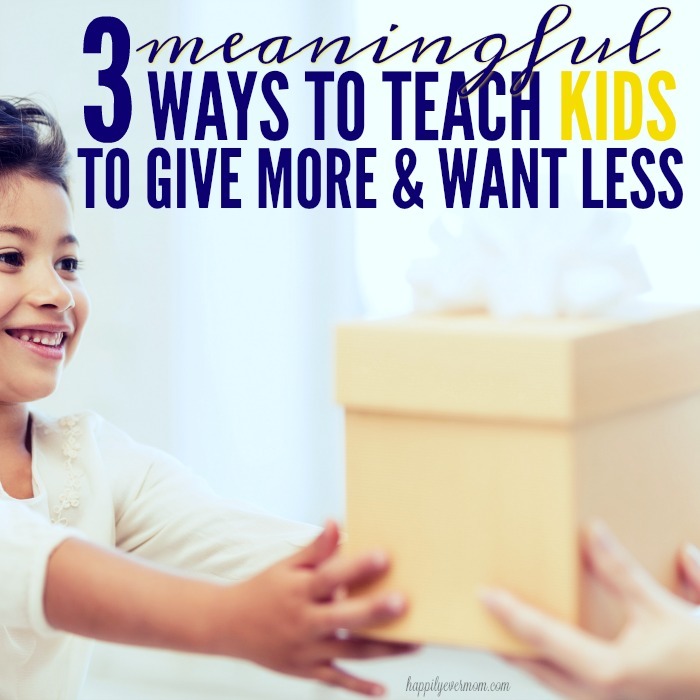 Based on that, here’s the 3 meaningful ways we’re working on teaching our kids to give more and want less. It’s not perfect, but it’s a start. Give donations: Take an amount of money that you would use to purchase a “thing” for your child, and let them donate that money instead. Think local so that kids can see the direct impact that they can make on their community. Give time and talent: Let your child give the gift of their time and talent this season. For example, my daughter loves to cook. She can give her talent by volunteering at a soup kitchen, stocking our church’s pantry with food, or making food to donate to someone who needs it. Interview your family: since it’s easy to purchase gifts off of Amazon wishlists (I love our wishlist, don’t get me wrong), but teaching kids to dig a little deeper and brainstorm meaningful gifts for others is important! Have them call a loved one and asked what they loved most about this past year. Brainstorm gifts based on what they love to do rather than giving them more things. I hope my kids see that Christmas is still special, still magical, even if we don’t solely focus on the things that their getting this year. I hope they’ll see that giving gifts can be just as fun as receiving them.